Just mention the name Abbotsbury and the eyes of old timers will light up. It reminds them of grand society weddings where the Who’s Who of Madras congregated, the swish of silks, traditional delectable South Indian fare when it came to food, the best of classical music and dance, the glitter of diamonds… and then they will also add that very few of the weddings held at ‘Abatspari’ (as it was referred to in local parlance) lasted. Some add more spice to it by stating that all the unhappiness came about owing to an Abbot who lay buried there, thereby explaining the name and the strong miasma of unhappiness that pervaded it. All fiction of course. Reality was more prosaic. Abbotsbury is a village in the English county of West Dorset and the property in Madras was no doubt bestowed that name by some homesick owner/occupant. It was one of several large garden bungalows that once dotted the city, most with names of villages ‘back Home’ – Hazelmere, Rostrevor, Minster Lovell and Monksilver being some others that come to mind. Abbotsbury stood on the east of Mount Road, bordering the village of Teynampet. On other side of the busy thoroughfare was the Long Tank of Mylapore, now the bustling locality of Theyagaroya Nagar. It is generally believed that Abbotsbury emerged from the division of a larger property that once encompassed much of the locality. This was Teynampet Villa and the first occupant on record of that place was Maharajah Sir Goday Narayana Gajapati Rao, a wealthy landowner from Vishakhapatnam. He it was who funded the statue of Queen Victoria that stands outside the Senate House. Gajapati Rao died in 1903 and it is likely that the property was divided and disposed off in lots on one of which came up Abbotsbury. The name exists on maps from at least 1921 onwards. As to who occupied Abbotsbury or owned it in its early years is not known. What we do know is that sometime in the early 1940s it was requisitioned by the Government and made over for housing civil servants. In 1942 we see AF Southorn, Press Officer of the Madras Secretariat residing there. Then in the early 1950s it was allotted to P S Viswanatha Iyer, ics. Acknowledged as the man who brought table tennis to India, a sport he learnt in the UK while sitting for the ICS examination, he was in 1950 Secretary, Department of Development, Government of Madras. His stay at Abbotsbury was short, for in 1953 he was killed in an air crash. It would appear that the Government derequisitioned the property thereafter. Abbotsbury was acquired (or was probably owned even earlier) by C.S. Loganatha Mudaliar, a businessman with interests in civil engineering and the cement industry. In the former, he was in partnership with Jahan Bux Tarapore, the Parsi entrepreneur, the firm being Tarapore & Co. It put up several iconic structures in the city and also came to own Abbotsbury. Tarapore, often mistaken for an Englishman because of his mode of dress and his speech, managed the property and it was under his governance that it became a wedding hall and a venue of choice for public meetings. At a time when hotels were few and far between and the Music Academy was still being built, this was where companies held their annual general meetings. As actor Mohan Raman has written, a crucial gathering of the DMK took place here, an event in which four future Chief Ministers of Tamil Nadu were present. The Government used it for several of its events. Tarapore was known for his charitable disposition and he allowed several social service organisations to hold events here free of cost. Tarapore placing Abbotsbury at her disposal made possible Mata Amritanandamayee’s first visit to the city in the 1970s. But its reputation of being a star-crossed venue dogged its footsteps. Many of the high society weddings here ended in break ups. The marriage hall was hardly to blame for this but at a time when divorces were relatively unknown in Madras, every broken marriage made it to the news and did the gossip rounds. Was it Abbotsbury’s fault that top-ranking actresses and actors were married here to commoners while their hearts clearly belonged to others? The public believed it was so. And when someone remembered that both daughters of old Goday Narayana Gajapati had difficult married lives it blighted Abbotsbury further. There were other stories that stoked the rumour fires as well. Tarapore’s family was involved in a horrific motor accident after he came into the possession of Abbotsbury. His wife Dhun died of completely unrelated causes later but that did not prevent a story combining both events. The lady incidentally is commemorated by way of Dhun Buildingson Mount Road and a school in her memory at Ayanavaram. In the early 1980s, Tarapore donated Abbotsbury to Sathya Sai Baba of Puttaparthi. He had been an avid devotee of the god man and the latter had been a frequent visitor to Abbotsbury conducting several public meetings there. That this was when several controversies about Baba emerged may have been mere coincidence but people attributed it all to the Abbotsbury effect. Early in the 1990s, the Satya Sai Baba Trust sold Abbotsbury to Magunta Subbarami Reddy, Congress MP and owner of the then high-profile Balaji Group of companies. It was announced that the property would be developed into a five-star hotel in collaboration with the Oberoi Group. Work began in right earnest and it appeared that the Cassandras were all wrong for a change. But then in 1995, Subbarami Reddy was shot dead by Naxalites and his group went into a huge decline. Its dues to the Royapettah Benefit Fund caused the latter company to close its shutters as well. That launched a chain of several other insolvencies in the city. The resulting depression shook the business climate of Madras quite a bit. Balaji Distilleries, the flagship of the group, was eventually sold to United Spirits of Vijay Mallya. It must be added here that the latter’s present troubles have, however, nothing to do with Abbotsbury. Right through the 1990s, the proposed Magunta Oberoi remained a half-finished glass-fronted hotel building with giant beehives hanging from it. That gave rise to yet another legend – honeybees (thenee in Tamil) liked Teynampet and so the place got its name that way! In 2005, the Maguntas and the Oberois parted ways over the hotel and the property was up for sale. Lalit Suri had almost decided on purchasing the property when he died suddenly (Abbotsbury effect?). It was then acquired by the Saraf Group, which signed up with the Hyatt chain of hotels. A part of the land became a mall and the remaining opened as the Hyatt Regency in 2011. Whoever designed the interiors clearly decided to look at the lighter side. All along the floor housing the restaurants are fake beehives made of metal, suspended from the ceiling. That brings to mind the two decades when bees were the only tenants of the property. Hopefully, the place has laid all its ghosts to rest, for the hotel is well patronised though the same cannot be said of the mall. The name Abbotsbury is commemorated in a meeting hall at the hotel. It is also remembered in an unrelated block of flats down C.P. 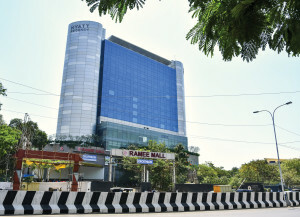 Ramaswami Iyer Road.